I had climbed both sides of Oberalppass in the morning and it was hot. 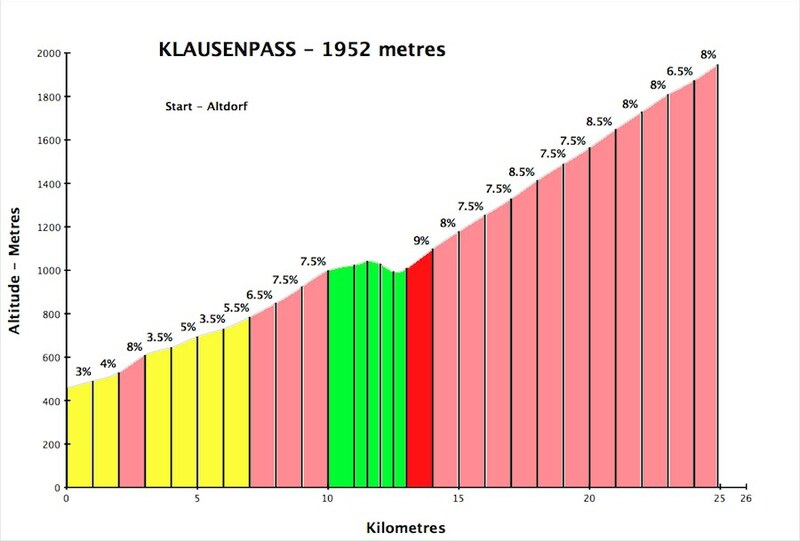 But if I didn’t do the Klausenpass now, it would be next year. 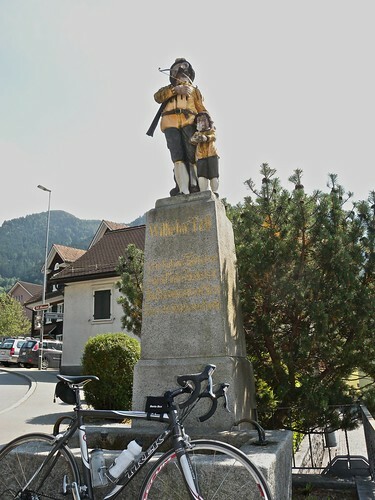 The climb starts in Altdorf. This is where William (Willielm) Tell, in 1307, is said to have successfully shot an arrow through an apple on his son’s head after refusing to bow to the local Hapsburg leader’s hat which had been placed on a pole. Long story short: the event caused a rebellion that led to the creation of the Swiss confederation. So he is a founding father. The first half of the route passes the William Tell museum (and statue at left) and slowly climbs out of the valley. After a short descent after about 10 kilometres things get interesting. 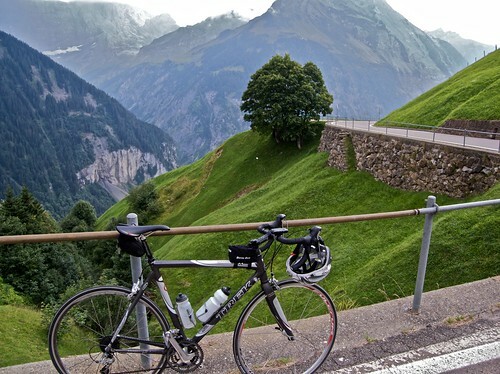 From Unterschachen, the road goes up along an amazing cliff road for most of the remaining ride. I have a little vertigo and found myself riding in the middle of the road. Beautiful views of waterfalls and the valley far below. Unfortunately, the weather was changing for the worse and threatening clouds and a few drops meant I kept pushing my tired legs. But the weather held. All in all, I enjoyed this climb more than I had expected and was pleased I had convinced myself to attempt it even after a relatively tough morning. 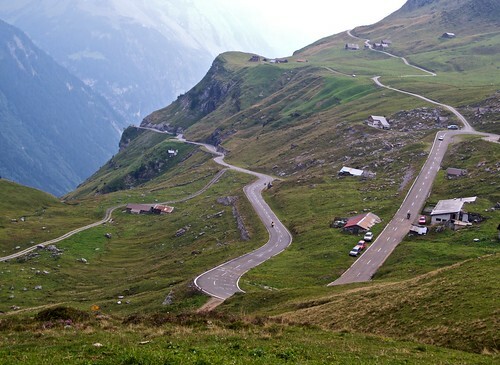 looks astounding – how you got both those climbs in (well i guess 3 in total) in 1 day is also astounding!!!! Tony, Iseran traffic will be quiet on a Wednesday especially once above Val d’Isere. Enjoy, the descent is amazing. Hi Will, you were right – the road was empty, as was the main road for the second Col – Mont Cenis (about 1pm though, so French lunchtime!) – my word that landscape is strange in Isere – lunarlike!!!! 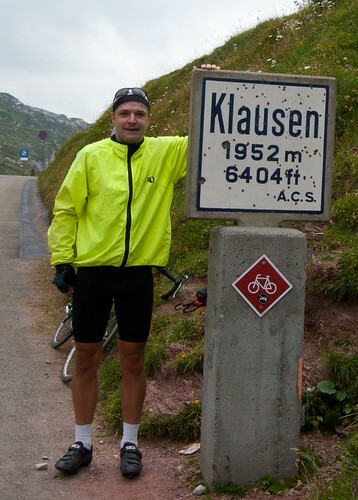 great riding though…. thoughts on your next challenges ahead?